Sony is not hosting a PlayStation event at this year’s E3 2019 conference. Instead, it’s kicking off a new ‘State of Play’ livestream series that will showcase all its upcoming games and hardware for the near future. Here’s how to watch the livestream of this inaugural Sony gaming event. From today, March 25, at 2pm. PT / 9pm GMT, the livestream will show all the goodies PlayStation has to offer in the coming months. It’ll be broadcast over Facebook, Twitter, Twitch and YouTube – just hit up any of those links and your preferred service will deliver hot fresh gaming action directly into your eyes, as it happens. What are we expecting to see? 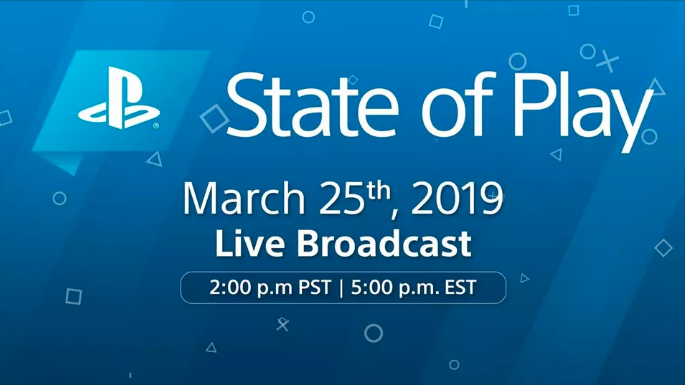 With no E3 plans and the PlayStation 4 hitting its twilight years, we’re guessing it’s going to be a big PlayStation VR focus during the Sony State of Play livestream. We’re most hoping to see some more on Blood and Truth, the cockney crime caper that captivated us way back in 2017, but has been quietly gestating ever since. Whatever happens, we’ll have all the details, so stay locked on TechRadar for everything you need to know.